Basketball: A game that was meant for the streets, courts, and playgrounds. Many of us have fond memories as a youth going to the playground seemingly every day in the summer months to play pick-up game after pick-up game. If you are like us at ListofFit, you would pretend to be your favorite player. Using their signature moves and celebratory gestures was a must. 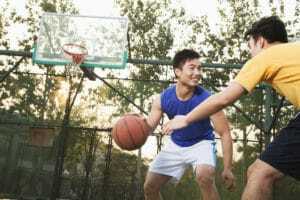 Outdoor basketball has a unique feel compared to its indoor counterpart. Most pick-up games are more physical, rely on players to call their own fouls, and often have a lot of controversy which only adds to the experience. The winning team stays on to take on the next competitor while the losing squad takes a seat until it is their turn again to try and take down the champs. Whether you are an aspiring pro, or just looking for a basketball to shoot around with on occasion, a high quality outdoor basketball will make playing outside more enjoyable. When considering a basketball for the playground it is important that it is durable as it will take a beating with outdoor play. This is due to the surfaces that the basketball is dribbled on, which usually consist of asphalt, concrete, or even gravel. Because of this you never want to use an indoor basketball for outdoor play, as they will quickly deteriorate and scuff. We have tested and compiled a list of our five favorite outdoor basketballs which we have listed in this nice table below. Each basketball has unique features that should be considered when deciding which ball will meet your needs best. We’ve also included a slider at the bottom of this article that has five shooting drills that will make you the next Steph Curry! Well, maybe not that good, but if you practice these drills regularly we guarantee your shooting skills will improve. Click here to skip to the shooting drills. Pros: This basketball mimics the feel of an indoor basketball better than any indoor/outdoor basketball available. Cons: May not be as durable as some of the other basketballs on this list. Bottom Line: Our top choice, the Spalding Replica Game Basketball has the quality to impress even the most particular basketball players. Pros: Featuring a durable cover with a good feel, the Under Armour 595 is a good basketball if you are looking for an outdoor basketball that will last. Cons: This cover of the 595 is more firm than we prefer and makes the basketball feel hard. Bottom Line: A good choice for those who are going to play on rough surfaces such as concrete and gravel. Pros: Has unique "wave" grooves that enhance the grip of this basketball making it the easiest basketball to palm on our list. Cons: Bounce of the Wilson Wave is not as consistent as some of the other basketballs on our list. Bottom Line: Get the Wilson Wave if you like basketballs with superior grip and an extra deep channel design. Pros: The Baden Contender has a very consistent bounce due to its build quality and Stealth Valve System. 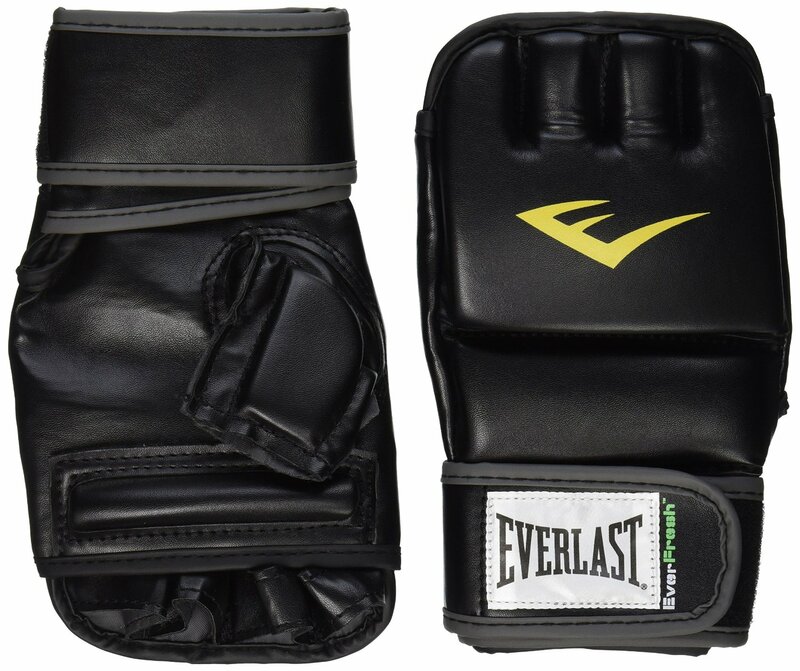 Cons: Channel design is a bit awkward and grip is nothing exceptional. Bottom Line: A solid choice at a reasonable choice, the Baden Contender is durable and testing showed it to have consistent performance. Pros: Unique diamond pebble design and quality performance shows the Jordan Legacy Basketball to be a solid choice for the courts. Cons: The composite leather cover is a bit firm for our liking. Bottom Line: The Jordan Legacy Basketball gets respect simply by its namesake. However, this basketball will stand tall on its performance and durability. When Spalding created the replica game basketball it wanted to recreate the feel of the official NBA game basketball’s quality at a price point that was affordable for all. The truth is that the replica game basketball’s composite leather cover does a great job at mimicking the feel of true full-grain genuine leather that is featured on the real deal. The cover is softer than the other outdoor basketballs that we tested, giving it superior feel. The bladder that holds the air is also one of the best we tested and is very symmetrical. In terms of basketball performance you often get what you pay for. Sure, you can find any rubber basketball and it will likely be cheaper than the ~$30 price point of the Spalding Replica Game Basketball, but its performance won’t even be on the same planet as the Spalding Replica. For the price, this is a great indoor/outdoor basketball. The Spalding Replica Basketball excels in several areas of performance. First, you are unlikely to find a basketball that can be used on outdoor surfaces that has better feel than this basketball. It has a soft cover when most other outdoor basketballs have a tendency to feel too firm. The bounce of the Spalding Replica is also very consistent for an outdoor basketball and you can trust that when you dribble the ball it will bounce where it is supposed to. No off-center bounces were seen when using this basketball. Grip on this basketball is good, but if you want a basketball you can palm then look elsewhere. The Spalding Replica Basketball is about feel, which we feel is a more important factor when reviewing basketballs than is grip. The only questionable area for the Spalding Replica Game Basketball in terms of performance is durability. This is the flip side of having such a soft cover with a nice feel; it may break down faster than some other basketballs with tougher covers. However, at the price we would be fine with replacing the Spalding Replica Game Basketball every couple of years to get the performance that it offers. 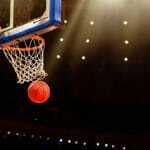 Spalding is a very well known basketball brand that also makes highly rated basketball hoops. Under Armour is one of the up and coming basketball manufacturers out there. They have benefited greatly from their sponsorship with one Steph Curry. In terms of the Under Armour 595 the materials are of above average quality. Under Armour promotes their cover as having “UA Gripskin”, but honestly we don’t feel anything particularly special about the feel of the cover. This basketball features a butyl bladder that is the standard for air retention. The Under Armour 595 is also NFHS approved, so it can be used for official high school basketball games. 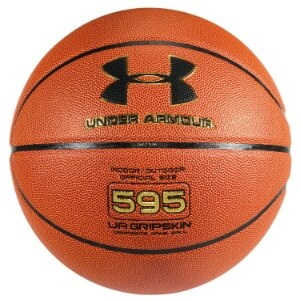 The price of the UA 595 Indoor/Outdoor Basketball is around $30. This is on the slightly expensive side when compared to other similar outdoor basketballs. This basketball suffers in its value score because it simply does not live up to the performance of the Spalding Replica Game Basketball, other than the UA 595’s cover is more durable. In terms of performance, the Under Armour 595 Basketball really shines with its consistent bounce. This basketball has never given our testers an off-center bounce over many shooting sessions. The feel of this basketball is a bit firm for our liking, but this also gives the cover of the basketball greater durability. The grip of the Under Armour 595 is nothing special and will be difficult to palm for most players. Realize that with multiple uses the color of the cover will fade, but this is common with most outdoor basketballs due to the rough surfaces they are used on. We recommend the 595 to players who want durability and consistent bounce performance. Wilson is the official basketball manufacturer of the NCAA. They have come up with an innovative technology that is at the heart of what makes their Wilson Wave Basketball unique. The Wilson Wave features “waves” on the cover that enhance grip, allowing more players to palm the ball. The channels of this basketball are deeper than those found on Spalding basketballs; which channel style you prefer will be a matter of personal preference. This basketball has a cover made of composite leather, and air is retained efficiently via the butyl bladder. Currently, the Wilson Wave is priced around $35. This is pretty expensive for an outdoor basketball. However, realize that prices on basketballs fluctuate frequently, so a basketball that is expensive one day may be a steal a month later. At the current price point we do feel that there are better values to be had than the Wilson Wave. The Wilson Wave’s goal is to create an indoor/outdoor basketball that has exceptional grip compared to its competitors. There is little doubt that it achieves this goal. Many players who cannot palm other basketballs will be able to palm the Wilson Wave. While this enhanced grip is great, we do feel that the “Wave” technology does take away from the overall feel of the basketball. The bounce of the Wilson Wave is good, but not great. You may find it will give you a weird bounce here and there, but this will be rare. Because of the waves, you may get greater rotation on your shots, although we did not specifically test this. 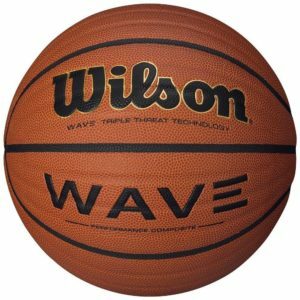 The cover of the Wilson Wave is nicely cushioned, and has average durability for an indoor/outdoor basketball. Baden may not be the first name that comes to mind when considering an outdoor basketball. However, you should give the Baden Contender a serious look as it is a good basketball that will offer good performance after long-term use. As with the other basketballs on this list the Baden Contender features a composite leather cover. The most unique design feature of the Baden Contender is that it has a Stealth Soft Valve, which hides the air valve used to pump the basketball. Baden also touts the symmetrical nature of their basketballs claiming that you will never get a bad bounce. The Baden Contender also comes in a variety of color combinations including green, blue, red, and pink that make it not only a good basketball to use but also fun. At around the $25 mark the Baden Contender Basketball is a good value for the money. At this price point Baden’s outdoor basketball is priced right around the mid-point for high quality indoor/outdoor basketballs. While you can find cheaper basketballs than this, it will be hard to find a lower priced option that does not sacrifice in terms of performance. The Baden Contender is a basketball that does all things well, but does nothing exceptional. The cover of the Baden Contender is somewhere between the extra soft Spalding Replica and firm Under Armour 595. We do like the Stealth Valve System as it does make the air valve less intrusive and this results in more consistent bounce performance. 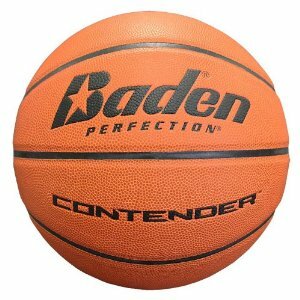 The channels of the Baden Contender Basketball are pretty standard, so do not expect to be able to grip this basketball like you would a Wilson Wave. We rated the durability of this basketball to be slightly above average, so it should last a reasonable amount of time under normal use and conditions. The name Jordan brings a sense of greatness that is rarely matched. The man is a legend and has developed a basketball gear and apparel empire. 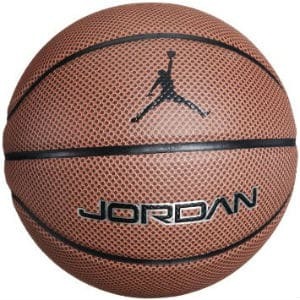 The Jordan Legacy Basketball brings this reputation in the form of an outdoor basketball. The composite cover of this basketball is quite unique as the pebbles are diamond shaped rather than the traditional circular shape. The channels on this basketball are fairly wide with standard depth. The color of the Jordan legacy is a richer brown than the other basketballs reviewed, giving it a classic look. Overall, the materials on this basketball are above average compared to other similar options. At around $30 this basketball is slightly more expensive than most other outdoor basketballs. The quality of the Jordan Legacy keeps its ListofFit Value rating from dipping lower. Overall, this is a good value and you should feel good about forking up a few more dollars for the enhanced quality and performance. The Jordan Legacy shines in areas where other basketballs on our list fall short. Based on input from users, this basketball does not attract dirt, which keeps it clean and keeps the grip consistent. The Jordan Legacy also got high marks for its durability as the cover holds up well after multiple uses. Air retention of this basketball is also good, and should not need to be refilled much especially during the warmer months. The feel of this basketball is good, but not quite as good as the Spalding Replica Game Basketball. There really is nothing about this basketball that we can complain about in regard to its performance. You can buy the Jordan Legacy with confidence. While each of the five outdoor basketballs we have discussed in this article are great choices for specific reasons, the best outdoor basketball available today is clearly the Spalding Replica Game Basketball. No other basketball that can be used indoors and out has as good of a combination of feel, grip, bounce, and value. For an outdoor basketball the Spalding Replica feels more like an indoor basketball than any of the others due to its high quality cover. The channels on this basketball are standard sized, which we again feel mimics the style of top of the line indoor basketballs. 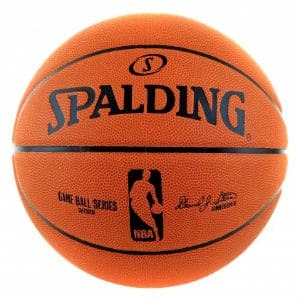 Spalding is the official basketball brand of the NBA, and their reputation shines through with this product. If we were buying an indoor/outdoor basketball for ourselves there is no doubt that the Spalding Replica is the one we would go with. Durability may not be the strong point of this basketball, but at the reasonable price point it does not take away from how good this basketball is. Basketballs can vary greatly in terms of quality and the materials that are used. 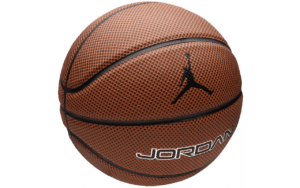 Most modern indoor/outdoor basketballs use what is called composite leather for their outer cover. Composite leather is a fake leather that is made to feel and perform in a similar fashion to genuine leather, but more durable. Higher end outdoor basketballs will also feature a butyl bladder that helps to contain the air within the basketball, and a channel design that enhances overall grip. Other basketballs have unique features like the waves in the Wilson Wave and the Stealth Valve System found on the Baden Contender. Most indoor/outdoor basketballs are priced somewhere in the $20-$40 range. As you can see basketballs are a reasonably priced product due to the amount of manufacturers in the basketball market. Because of this, value in basketballs is primarily found in the quality of the materials and the performance of each specific basketball. This is where the best outdoor basketballs really shine and the others drop off. Performance takes into account several factors. The first factor is how consistent does the basketball bounce. 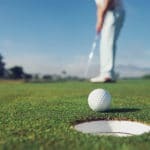 Is it easily handled, or does it have off-center bounces that make losing your handle more likely? Another factor is grip. Most people like to be able to palm the basketball as it can enhance the control of the ball during play. Feel really takes into account how the ball feels in your hand while you are shooting or dribbling. Does it feel well cushioned or too firm? When you shoot are you able to get good rotation from your fingertips? All these are questions we asked when considering which basketball was best. As any true baller will tell you, having a sub par basketball is one of the fastest ways to get mocked at the courts. And you do not want to be that guy! The truth is that having a good basketball will make the whole experience of playing basketball better and more enjoyable. Nobody likes to play the game with a basketball that is warped, worn out, and a plain out piece of junk. Players want a basketball that offers a cushioned cover with solid grip that will dribble like it is an extension of your body. Not only that, a basketball that is going to be used outdoors needs to be durable. Sure, the Wilson Evolution is a great basketball, but due to it being an indoor basketball exactly how long do you expect it to last when you use it on concrete? Answer, not very long. With the prices of basketballs being reasonable, there really is no excuse any longer to be stuck playing with a low end rubber basketball that offers no feel. Spend an extra $20 and get a top of the line indoor/outdoor basketball that provides a composite leather cover and other high end features. 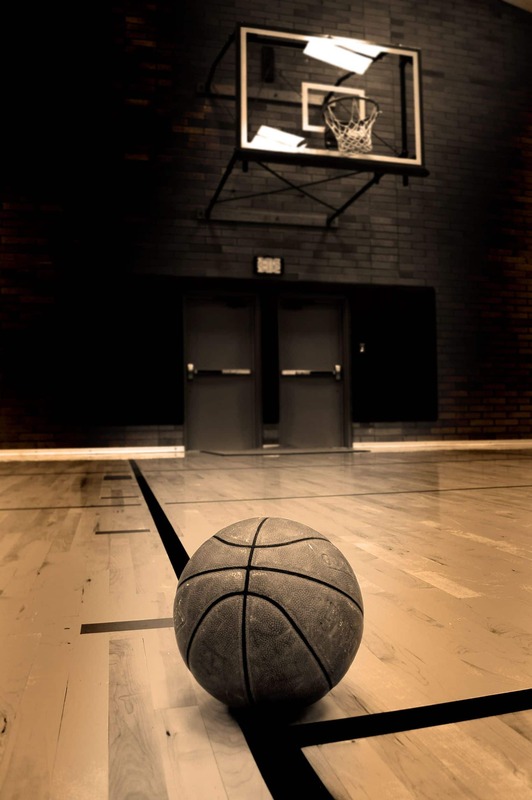 If you an aspiring NBA level pro, then you owe it to yourself to invest in a good basketball. Be the guy who brings that basketball that everyone wants to use (just make sure to use a Sharpie to write your name on it). Enjoy the courts, and play all day and night! Okay, that title may be a bit of a stretch, but the fact is that if you practice the five shooting drills in the slider below you will improve your shooting, guaranteed! 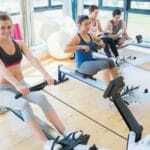 We suggest doing the drills on rotation for a minimum of two full rotations a day for maximum results. FYI, click the play icon on each slide to play the drill video. 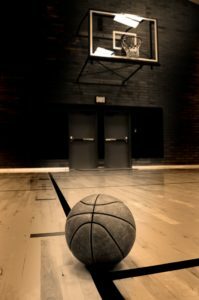 This drill originally comes from our sister site at BestOutdoorBasketball.net. In the video I show you how to effectively complete the five spots shooting drill and how it will make you a better more consistent shooter while on the run. This drill is a great way for players to get comfortable with shooting mid range jumpers off the dribble. You will pick an elbow and take two dribbles to that spot. Once there, you will retreat dribble twice as if a defender is pressuring you. After you have returned to the key you will square up, make a crossover dribble, take two dribbles to the other elbow and pull up for the shot. The 3-pointer solo drill is great for those who want to shore up their shooting from long distance and you don't have a rebounding partner. It helps to give you experience from different shots around the 3-point arch. The steps to the drill are as follows: shot a three from the key to get started, get your rebound, dribble back out to a different area of the 3-point line quickly, as you approach the 3-point line throw the ball with backspin so that it will return to you (like a pass), shoot the three. It is said that Reggie Miller used this shooting drill on a regular basis to improve his shooting skills. Drill Instructions: Start at the free throw line with your back turned to the basket, jump 180 degrees to face the hoop, then immediately take your jump shot. 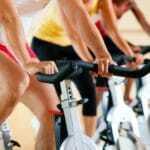 Do this drill repeatedly to build eye-hand coordination as well as leg strength. This last drill is more advanced than the first four so it may not be right for you if you are just getting started playing basketball. However, if you are a skilled player then you will definitely want to practice this drill to give yourself a new weapon. We won't explain the exact steps of the drill, but the goal of the look away 3-point shot is to not give away the fact that you want to shot to your defender. The idea is very similar to the no look pass.